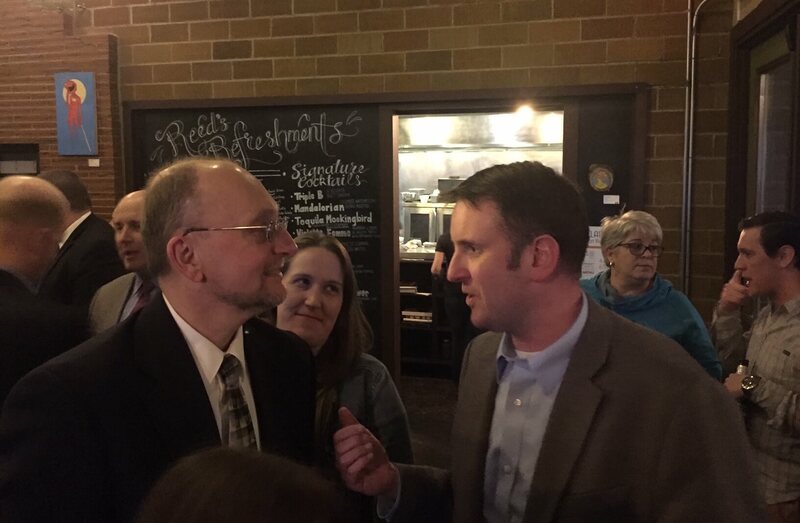 A packed room of nearly 100 Democratic activists in Des Moines’ Beaverdale neighborhood gave Todd Prichard a positive reception Tuesday night as chatter increases over his likely run for the governor’s office. Prichard, a state representative from Charles City, previewed a very early version of a stump speech, focusing on several stories from his blue collar upbringing in Davenport and his service in Iraq. “I am considering a run for Governor,” Prichard acknowledged right off the bat to the gathered crowd, adding that he’s doing his due diligence to get around the state and listen to voters. He spoke to local Democrats in Albia over the weekend. Jim Mowrer, last year’s 3rd District candidate, introduced Prichard, his former company commander. Mowrer noted that he trusted Prichard with his life as they served together in the war zone. Prichard turned several times to that service to relate to the challenge Democrats in Iowa face under a Republican-controlled state government. At one point he recalled a difficult mission his troops were tasked with – holding a position against a much larger Iraqi force – and how he had to explain the situation to his soldiers. Prichard took multiple shots at the Republicans for the swift passage of the collective bargaining bill. He talked about how the same people he grew up with, people who worked in factories and would show up to school plays in blue jeans and work boots, were the ones now being targeted by the Republican Party. But those were also the people that Democrats lost in 2016, he noted. Prichard related it back to his Davenport childhood, where he came home one day and was in terrible pain, which he thinks now may have been a kidney stone. His family had no health insurance, however, and couldn’t afford the thousands of dollars it would have taken to go see a doctor. Prichard pointed out that he was the only Democrat on his ballot to actually win last year, and that his district was at ground zero for the Donald Trump wave. Northern Iowa saw some of the biggest swings to the Republicans in the state. While taking questions, one man asked Prichard about how to combat the Republican Party’s usage of dog whistle racism, which seemed to have a major impact on some voters’ choices. He also encouraged the crowd to stay involved, adding that he was optimistic by the enthusiasm of Democrats he was seeing across the state. Warning that “complacency kills” in politics just like in the army, he said that the outpouring can’t just be “flash in the pan” activism, but a slow burn of involvement leading into 2018. Prichard spoke just feet from Senator Janet Petersen, who represents Beaverdale and seems to be considering a run for governor of her own. Overall, the little-known Prichard gave a strong – if not yet perfectly polished – speech, impressive for someone so early in the process. He also was very at ease with the 40 minutes of questions he took from the crowd, not hesitating much or giving vague answers. Several of the attendees noted that they wanted to see Prichard after just recently hearing about him and his interest in a statewide run. They came away impressed.